For the BBC (16.00 London time) a revolt in Greece directly threatening the expansion of NATO was not among top stories. It preferred to speak at length about a train crash in the USA and what is going on in Maldives. But it is clear that today’s monster meeting in Athens is seriously complicating the NATO and EU’s project of incorporating more countries of the Balkan region into Euro-Atlantic structures, thus expelling any remaining Russian influence and solidifying the control of the peninsula by Washington and its generals. Hundreds of thousands of people (significantly more than 500.000 according to reliable specialists) gathered in the center of Athens to ask their government not to concede to the use of the word Macedonia or its derivatives by the Former Republic of Macedonia (FYROM) in one of the biggest demonstrations organized in Athens, comparable to the last great anti-austerity meeting of 2012. Such numbers represent something more than 5% of the whole population of the country. An agreement between Greece and FYROM about the name of the latter is a precondition for admission of FYROM into NATO and EU. The central speaker of the meeting was the Greek composer, Mikis Theodorakis, a world known symbol of resistance, who asked for a referendum to be held if the government wants to conclude an agreement. Theodorakis was firm that FYROM must be prevented from joining NATO or the EU if it insisted on keeping the word Macedonia in the name of the country. Professor Kasimatis, one of the top Greek specialists on Constitutional Law spoke also to the crowd, explaining the link between foreign policy concessions, the colonial terms incorporated in the Agreements with Creditors (EU, IMF, ECB) and the betrayal of the 2015 referendum. The meeting was greeted also by representatives of the hierarchy of the Greek Orthodox Church. The Archbishop had originally discouraged people from participating in public meetings for Macedonia, before the Salonica meeting, but he was obliged to change his position under the pressure of its success and of the public opinion. As for the Greek government and, in particular, Nikos Kotzias, the Greek Foreign Minister, they seem completely detached from reality, if their reactions to today’s demonstrations are anything to go by. Or, alternatively, Kotzias is getting with him the whole government, into his line. Anyway, demonstrating a public ignorance worthy of Marie Antoinette, they dismissed the demonstration as not much of a success! 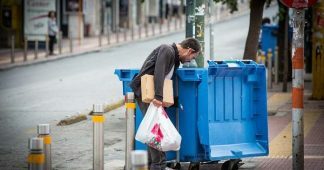 The Greek government is under heavy pressure from the US administration, to whom they have probably made commitments they are finding difficult to fulfill without committing political suicide. Tsipras understands that more than Kotzias, but he does not seem to be able to react to the line of his own Foreign Monster. The fact is that if they stick to their present position, they will clash frontally with Greek public opinion and provoke a very dangerous crisis in the country. It is not just that 70% of the population is against their policy, it is also that this opposition is very firm and considers the government’s policy a national betrayal. The demonstration today was peaceful today but the demonstrators appear willing to do everything to stop the parliament from ratifying any agreement Athens and Skopje sign. In the beginning, nobody paid much attention. Two activists, ex-members of the Movement of Independent Citizens, which was created back in 2011 following an appeal by Mikis Theodorakis, took the initiative to call for a protest meeting in Salonica. The aim was to protest the intention of the Greek government to conclude, under pressure from Washington, an agreement with the Former Yugoslav Republic of Macedonia (FYROM), better known internationally as the “Republic of Macedonia”, terminating the dispute with the latter over its name that has been ongoing since the breakup of Yugoslavia. After the capitulation, the defeat and the humiliation of 2015, Greeks have seemed unable to mobilize about anything. They were licking their wounds. They were looking more or less passively at the continuing destruction of their country and at its neocolonial plundering, by Germany and other EU countries, under the general direction of the IMF and with the green light of the USA. They had neither the courage nor the will to think through their problems. They did not have leaders or ideas or political subjects to lead a new revolt against the colonialist Troika. Many believed Tsipras and SYRIZA’s dire warnings about the cost and the uncertain outcome of any revolt against the creditors. They tried to forget and survive. This assassination of Hope has inflicted an unprecedented national depression on nearly all the people of the country of Apollo, the God of Sun. So no one expected any more than five or ten thousand people at the Salonica meeting. But something seemed to emerge from the very depth of the national, collective subconscious. It was the same thing that had happened three days before the referendum of July 5th,, 2015 and conditioned its result. There were not five or ten thousand in Salonica, they were probably around five hundred thousand, nobody knows exactly. It was not a simple demonstration, it was a revolt, even if peaceful, for the time being. And today, everybody waits a much larger crowd in and around the Constitution Square in the center of Athens, named after the 1843 Revolution which obliged the first King of the Country, the Bavarian Otto, imposed on Greece by the Holy Alliance, to accept constitutional rule. It will be a demonstration about Macedonia, against what many Greeks understand as one more usurpation of their history, their national symbols and their cultural heritage. But behind it, one clearly discerns the desperate cry of a historic European nation that has been insulted and offended, destroyed and plundered, by its own supposed Allies and Partners and by the Union it has adhered to. A nation which has contributed as very few to the defeat of Nazism, only to see now “democratic Germany” destroying it, with help from Brussels bureaucracy, the US and Goldman Sachs. 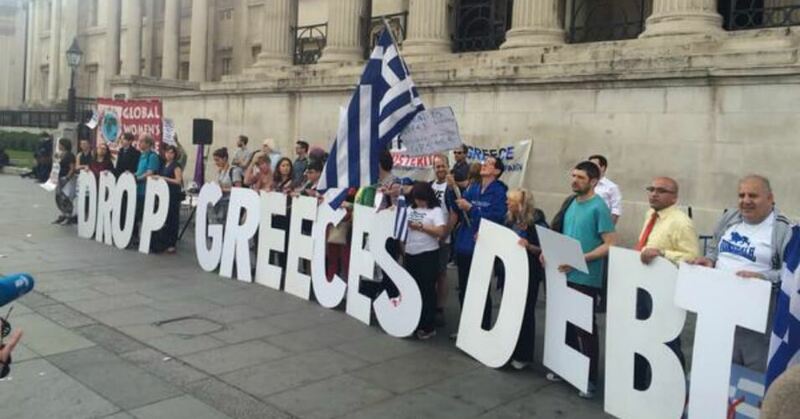 What Greeks will say to their government today will be essentially: Stop conceding the country to foreign powers. Give us back our country. For ten years Greeks have witnessed their “allies and partners” destroying their country, pretending they are helping it. They took and they are taking everything, the banks, the airports, the ports, the railways, the communications and the energy infrastructure. They confiscate even homes of ordinary people. Parents cannot bequeath their homes to their children because of confiscatory taxation, necessary for paying a “highly unsustainable debt” (according to the IMF). They have cut pensions 24 times. They have imposed on a member of the EU neocolonial terms not imposed to any Third World country. Greek mothers used to be the most overprotective of their sons, in all Europe: they wanted their children to live next door all their lives if possible. (Probably, because of what they had suffered under Ottoman occupation, when the Turks were rounding up male children of Christians). Now their dream is to see their children migrating to Australia, Africa or the Emirates to find a job. Greek hospitals are crumbling under German-EU draconian cuts to their expenses, but at the same time Greek doctors, for the education of whom Greeks have paid, are stuffing German or British hospitals. 72% of young people in Greece say to the polls they want to leave the country, if they will find a job somewhere. 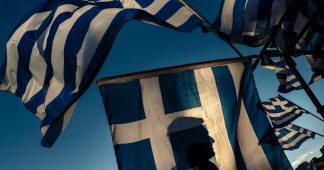 As a result of a program that is supposed to help Greece, the country lost 27% of its GDP, something comparable to what happened to US during the Great Depression, or to the Weimar Republic before the rise of Hitler. It is a bigger percentage than the material losses of Germany or France during the First World War. This is not a program of neoliberal “reforms”, it is a program designed to destroy a European nation and its democracy and to transform its state into an instrument of International Finance, with the long term prospect of creating a “Greece (and Cyprus) without Greeks”. No one can understand reality by taking for real what he believes its actors want or do not want to do. Attention must be paid to what is happening, to what the actors are doing, not what they are pretending to do or any the intentions that can be attributed to them. Under the cruel light of the available statistics, not beginning from any prefabricated theory or ideological or political or national preference, the program they imposed on Greece is clearly a program of destruction of a nation. If it was a mistake, they would long ago have found a way to correct it. Since they have not, it is because the “Greek experiment” is an important experiment in the advent of a new European totalitarian order. European governments and EU bureaucrats may or may not be conscious of that. But somebody has enough influence on them to impose it. 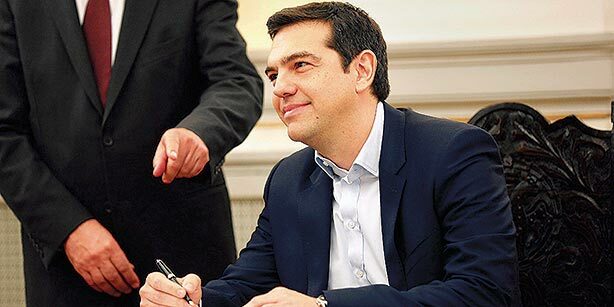 If somebody has some other serious explanation or theory about what has happened or is happening to Greece, explaining better than the above description what is going on, let him advance it. By the way, I believe the Empire of Finance was right in choosing Greece as its main target for a variety of reasons. I find very symmetrical and quite justified to organize such a crime against the country in the language of which humans, for the first time in history, wrote the word freedom (Eleftheria), in the 8th century B.C. in Homer’ s Iliad). German newspapers were right in their comments about modern and also ancient Greece in 2009-10. Greeks have always been anarchists. Not only did they write the word Freedom in their language, they have dared to discover Logos, a word which means analogy, reason, motivation, cause, purpose, logic, all at once, and to oppose it to the divine order. In Athens they decided to write off the Debts of the poor people and then, based on that experience, they dared to spell, first in History, the word Democracy. This is one of the reasons I strongly believe the choice of Greece as the first target of the Financial Totalitarianism was correct. Symbols are always important. They help shape thinking and emotions. In 2015, the Troika was able to deal a devastating moral and psychological blow to the Greek people by transforming its supposed Left into its instrument. The blow was even more important as partisans of the Greek Left had shed oceans of blood to defend their country, its democracy and the social rights of its people. That was why it was a blow to the sense of dignity of the Greek nation. No nation, especially no nation living in this geographical location, in the intersection of the Slavic, the Middle Eastern and the Western European worlds, no nation bearing the tradition of such a History, can exist without its dignity. This is why the capacity of the Greek people to project any kind of social resistance was near to zero, after 2015. But this unequal duel between the Empire and the Greek “national DNA” was not over in 2015. Neither side was satisfied. The empire was not satisfied by simply transforming Greece into a “debt colony”. It wanted more, it wanted the geopolitical and cultural “capital” of the country (and of Cyprus), which is also the main remaining arms of the Greek people, if it will wish one day to reclaim the control of its state. It wants to get from the Greeks their legitimate rights to exercise sovereingty over its country, and in particular in the Aegean, in Cyprus, in Crete, in Northern Greece. Because Greece and Cyprus control the access of Russia to the Warm Seas, they are located between the Middle East and Western Europe. The Empire deems necessary to control Greece (and Cyrpus) in the strictest possible way, because since 1200 their control is absolutely essential to launch the Crusades against the East, the Islamic or the Russian one. On the other side, the national feeling and pride of the Greek nation was not dead, in spite of the terrible 2015 defeat. This is pushing now to a new revolt, but, unfortunately, it is a revolt without any leadership, any clear political and social aims or ideas. The Empire was able to “decapitate” the Greek nation, as it has largely achieved with nearly all European nations and to control all its politics and potential representatives. Greeks will cry today for Macedonia because, as they understand it, somebody wants to take from them their symbols and their cultural heritage, to usurp their History. They will also demonstrate today because they believe all the main political parties of their country are sold to foreign powers and these foreign powers are destroying their country. And they will do it because they have not, for the time being, any tool to challenge, for a second time, the economic and political Imperialism of Germany and the EU. Since the dissolution of Yugoslavia, Greece has refused to recognize any “Republic of Macedonia” on the grounds that such a name may reflect territorial claims on Greece. Most geographers and historians worldwide define Macedonia as a wider multinational region, following the administrative delineation of the Ottoman Empire, where Macedonia once belonged. More than half of Macedonia, as defined above, belongs today to Greece, about a third is FYROM, most of the remaining is the Bulgarian Pirin Macedonia and a tiny part, about 1%, belongs to Albania. Because of Greek opposition to the recognition of this new state, produced out of the destruction of Yugoslavia, as “Republic of Macedonia”, it was admitted in the UN as Former Yugoslav Republic of Macedonia, until Athens and Skopje agree to a name commonly accepted by both sides. But Greeks do not define Macedonia in such a way. They identify it with ancient Macedonia which is now Greek Macedonia. And this is an important part of the Greek national ideology. This is one reason they cannot easily accept a Republic of Macedonia suddenly appearing in their northern frontiers. When Greeks say Macedonia is Greek, which may seem offending to foreigners, they mean Greek Macedonia is Greek. The nature of today’s Greek nationalism is essentially defensive. The bloody destruction of Yugoslavia, by Western forces using nationalisms (in the name of combating them!) has created a legitimate fear among Greeks that their country may come next, in the context of the “new world order”. Some of President Clinton declarations about Balkans could also be interpreted as an indirect threat. Those fears are also fuelled by FYROM’s official ideology, which presents all of Macedonia as one country with one legitimate, so to say, nation, the Macedonians. It represents a late mutation of the Komintern slogan of a “United and Independent Macedonia”, “United and Independent Thrace”, which crated a lot of huge problems, at its time, to the Greek communist movement. By the way the use of the word Macedonians to describe the dominant nationality in FYROM (our personal opinion is that the name Macedonian Slavs would be more clear), creates also serious problems, because it is implying that Greek, or Bulgarian, or Albanian Macedonians are not genuine Macedonians. But Macedonia in the wider sense was always a multinational region and it was for that reason French have named their famous salad Macedonian. They did it because it is made of many nationalities, exactly as Macedonia was inhabited by many nationalities. The first leader of FYROM, Kiro Gligorov, was a serious guy, member of the Yugoslav League of Communists. But later, forces controlled directly by US, the CIA and various “globalisation” think tanks have gradually taken complete control of the state and its political elite. 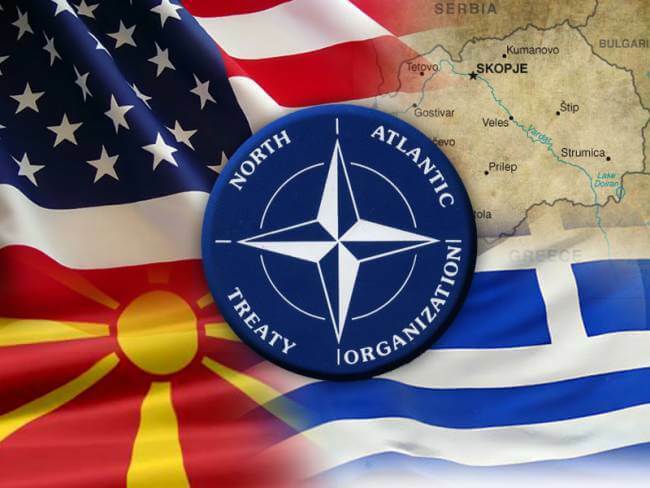 It is widely believed that CIA has played a huge role in bringing the new government in Skopje, in order to use it to “close” this question hindering NATO expansion and undermine any relation between FYROM and Russia. These forces have begun to construct a completely fake national ideology and history, pretending Macedonian Slavs are heirs of Alexander the Great and his Kingdom. The whole thing is ridiculous, as the first Slavs have come to the Balkans one thousand years after the death of Alexander. That way they try to refuse to the Greeks the use of their national cultural heritage, a part of which is Alexander’s saga, a heritage which is a strong ideological component of the Greek nation-state, the state chosen as the No1 target of the Empire of Finance in Europe. Indirectly, all that could lead into undermining the cohesion of Greece itself. This is happening also in many other regions of Europe, where nation-states are pressed from above (Globalisation and EU) and from below (“Europe of Regions”). We cannot consider the destruction of the nation-states progressive in any way, because it practically means the destruction of the sole level where there is still some degree of democratic control and social protection. The debate about a European federation is in reality misleading, as long as in reality we are not speaking of any kind of federation but of uniting European under the power of the Finance and of NATO. This kind of ridiculous ideological “ethnomechanics”, applied in FYROM has another consequence also, it is entrapping Slav Macedonians into defending a completely fake and ridiculous national ideology, thus making them more than ever dependent upon the empire. It is true that FYROM is too tiny to threaten Greece, but not if it would act as a strategic ally of Turkey or any other power threatening Greece. But the main wars now are not military, they are economic, political and ideological. The empire needs to destroy historical nations and their states, because they represent objectively a source of potential challenge to itself. Many British or American intellectuals do not grasp well the fundamental importance of the notion of the nation, an importance which Lenin understood very well and this was one of the secrets of the success of the October and subsequent Communist revolutions. Maybe they don’t grasp it because they come from nations which they believe or believed that all the world belongs to them. They don’t think in terms of Nations, they think in terms of Empires. By adopting the ideology of Globalization, that is of the World Dictatorship of the Finance, important sections of the Left legitimize imperialism and they inherit all its contradictions regarding nations and nationalisms. Because you cannot dismiss Nations and Nationalisms in general, criticize Serbs, Greeks or Russians for “nationalism”, and then use Croatian, Albanian or Ukrainian nationalisms. You cannot accuse Serbs as nationalists and then use other nationalism to destroy a multinational structure like Yugoslavia. Greek political parties were caught between their desire to satisfy Western powers, on whom they remain dependent and their own public. As a result, the official position of the country has oscillated from “no Macedonia, no derivatives” (1992) to “composite name with geographical connotation for all uses” (2008). But no Greek nowadays believes his parties are going to defend any position if subjected to western pressure. This is one of the reasons they felt they had to demonstrate. In 2008 they were believing their government was defending Greek national interests. Only 5.000 people participated in a demonstration similar to those taking place today about Macedonia. This dispute has been ongoing for 25 years now, without creating any particular problem for bilateral relations between the two countries. Nobody really cared very much about solving this problem, except one player, the United States of America. A peace loving power, USA is not confining itself to its peace building activities in the Middle East, the Korean peninsula or Latin America. It is also very interested in promoting prosperity in South Eastern Europe! FYROM is situated in the center of Balkans, between Greece and Serbia, Bulgaria and Albania. Who controls FYROM, controls the Balkans. Who controls the Balkans can wage war against Russia. It is as simple as that. Hitler was of the same opinion. This is why he devoted precious time and he lost his best elite paratroopers divisions in 1941 to smash the formidable resistance of the Greeks to the Fascist Axis before attacking Soviet Russia, probably losing the war because of the prior expenditure of effort in his Serbian and Greek campaigns. Germans do not seem to have forgiven Serbs and Greeks for that. This is the main, strategic reason US administration asked from the SYRIZA-An.Ell. government in Athens to conclude an agreement over the name quickly so that FYROM can become a member of NATO (and in the future of the EU). Berlin and Brussels are also pressing Athens in the same direction. The Athens government has some very dangerous traits. It does not understand Greek national feelings, it doesn’t have much understanding of foreign, military and international policy or, for that matter, of Greek History. They only want to satisfy the US, Germany, NATO, Israel etc., without even understanding the consequences for themselves and the country. Tsipras is a kind of Gorbachev in Athens, who makes any concession possible, without really realizing what he is doing. Of course this is not valid for all his government. Some of its members, like the Foreign Affairs Minister, Mr. Kotzias, realize too well what they are doing. Plan A of the Empire is clear: Solve the dispute between Greece and FYROM, dealing one more blow to the strength of the Greek national feeling, a historically un-parallel anti-imperialist force in the Balkans, along with Serb national feeling. Include FYROM in NATO, encircle and discipline Serbia, forcing it to accept the loss of Kosovo, extirpate the last remains of Russian influence in the Balkans and conclude the transformation of the region from the Mediterranean and the Adriatic to the frontier of the Donetsk and Lugansk Republics into a zone of strictly controlled protectorates, ready to go to war against the Russia. By the way, Balkans is also an alternative possible route of attack against Iran, through Greece, Bulgaria, Black Sea and Transcaucasia. A secondary aim is the inclusion of this region, or large parts of it in the EU, which will help finish any last potential of a united, independent, democratic Europe, leaving two main alternatives for the EU: to complete its transformation into a totalitarian imperial structure, under the control of international Finance and NATO, or to provoke its destruction in a catastrophic way. But what if the Plan A fails? Empires have always fall back plans. Besides, it is more than obvious that this one is divided between its “Bolshevics” (Huntington, Netanyahu, Trump, Le Pen…) and its “Menshevics” (Fukuyama, Obama, Merkel, Macron, Soros…). The failures of the latter and the general dissatisfaction they provoke, lay the grounds for the others to try making their reckless Chaos strategies dominant western strategies. One particular characteristic of the “Bolshevic” imperial faction is that it is using the methods of Entryism to put Neocons in all important positions of the western establishment. Another one is that they don’t present clearly their own program as such, they try to use the forces of dissent unleashed by the crisis of the mainstream western strategy, in order to radicalise it.They are producing fake revolts, color revolutions of different kinds, or they prove able to manipulate genuine ones. SYRIZA in Greece, Trump in the USA, Kurds in the Middle East are some of the examples one could cite. Last year, the Masters were debating in Davos about “post-Truth” and “post-Democracy”. The introduction of such terms is reflecting the extent of use of deception methods in contemporary politics. We cannot explore analytically here what can be at stake in the Balkans if the plan A fails. This is why we limit ourselves to some ideas circulating around, from time to time, like dismemberment of FYROM between Albania and Bulgaria, or trying to create “fake” and pro-imperialist in the last analysis nationalisms in Serbia and Greece, or the open destruction of democratic rule in Greece. In the long run, in case of a crisis of the EU leading to its destruction, one of the ideas and scenarios circulating is to incorporate all Southern Europe and Northern Africa into a kind of Meditarranean Union under the aegis of France and Israel. The only Plan which we cruelly lack is a Plan of cooperation of the Balkan nations and, beyond them, of Moldova and even Ukraine probably, if it gets rid from its present day dictatorship. All this region is now in ruins, as a result of Western military, political and economic inteventions, the object of a clear neo-colonialist policy. Such a Plan for South Eastern Europe could also be part of a Plan for a new, democratic, united, social and independent Europe, which we also cruelly lack.